BioAroma Herbal Shampoo for all hair types 100% natural - the best natural cosmetic available at www.ETERNEL.pl in category BioAroma herbal hair care. We recommend! 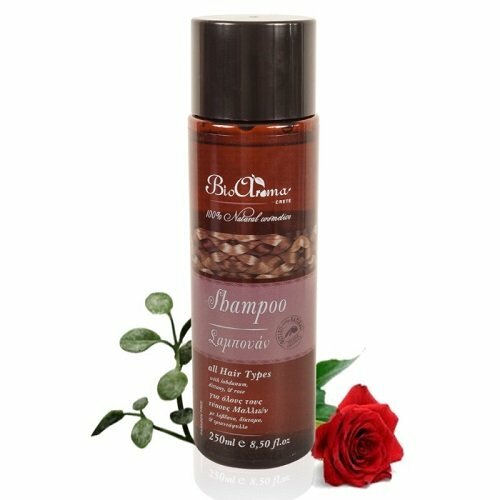 Natural herbal shampoo based on olive oil and essential oils of Labdanum, Dittany and rose water. Ideal for all hair types. Ensures healthy, strong and shiny hair. You save 20% (2,34 EUR). The shampoo contains extract of Labdanum and Dittany of Crete oil, known for its gentle antiseptic and soothing action. The shampoo composition is based on mild cleansing agents of natural origin (including derivatives of an extract from coconut oil and palm oil, compatible with ECOCERT) which does not irritate the scalp and does not affect the hydrolipidic layer of the scalp. Shampoo is enriched with rose water, which makes shampooed hair retain a nice smell. Shampoo contains unique 100% natural ingredients that provide an improvement in skin elasticity of the head, effectively regenerate it, delaying the aging process of cells, as well as an antibacterial and anti-inflammatory. Contained in the shampoo organic herb complex regulates sebum production and restores the balance of the scalp, strengthens and tones hair. The shampoo is suitable for frequent, even daily hair washing. Apply a small amount of shampoo on wet hair. Wash hair gently with formed foam. Rinse after a few minutes. Wash hair again and then rinse thoroughly with water. On washed hair, use BioAroma mask strongly regenerating damaged hair with high content of organic ingredients - shea butter, avocado oil and hair reinforcing laurel oil. Mask perfectly take care of damaged hair with split ends, provide healthy, strong and shiny hair.